Black Color Helps Fixture to Blend in Anywhere. 12-Pockets to Display Many Magazines. Steel Frame is Strong & Durable. 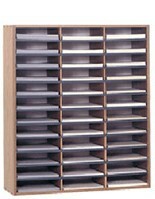 This countertop flyer holder for business is made of steel and designed with 12 pockets that are 8.5” wide. 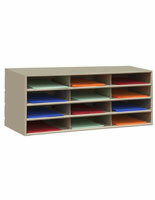 The literature display is created so it is best placed on desktops or similar structures. The flyer holder for magazines makes sense when used as a retail display in a book store to sell publications of various types. 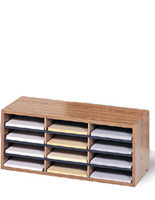 The literature display is also ideal for use as an employee mail system or in a craft or office supply store to sort paper types. The holder looks great on any desktop because of its black finish and easily sets off any magazines that might be for sale inside. 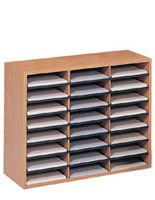 The pockets have enough height that it is easy to place multiple copies of periodicals or forms for less refilling.